Woman on phone: Hello, I wish to complain about your company’s compact fluorescent light bulbs. The package says lifetime 10,000 hours. But they burn out in weeks. Voice from phone: Ma’am, we use rigorous statistical methods. Unless you do the same, your results will vary significantly. 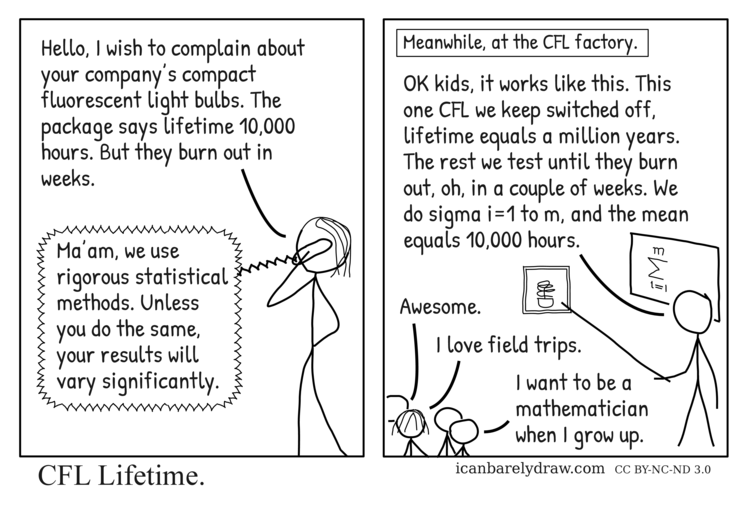 In the next panel, the narrator's text reads: Meanwhile, at the CFL factory. Man with pointer: OK kids, it works like this. This one CFL we keep switched off, lifetime equals a million years. The rest we test until they burn out, oh, in a couple of weeks. We do sigma i=1 to m, and the mean equals 10,000 hours. Several children are in the audience. Child 2: I love field trips. Child 3: I want to be a mathematician when I grow up.